This document provides a compilation of services, policies, regulations, and procedures related to employment as a faculty member at Fort Valley State University (FVSU), a unit of The University System of Georgia (USG). 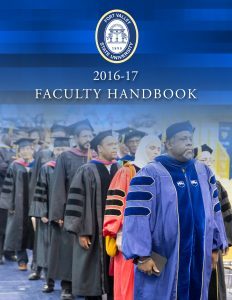 The Faculty Handbook includes policies, procedures and other pertinent documents at the University level, consistent with those of the Board of Regents (BOR). The Faculty Handbook serves as a guide; however, faculty members are, encouraged to consult the BOR Policy documents referenced herein for additional details.